Have Central Valley new home construction and sales hit bottom? Is an industry rebound imminent? It all depends on whom you talk to and the city you’re talking about. Talk to Andy Krotik, a Coldwell Banker Gonella Realty agent and self-proclaimed optimist, and the comeback starts today. Krotik is representing Clairmont Reserve, a once closed Atwater subdivision, which recently restarted new home construction. Krotik said Sterling Communities of Sacramento purchased 109 lots from the closed project at a bargain price. That’s the key to giving Clairmont Reserve a chance to succeed. Buying right allows the three floor plans to start at $169,900 for a 1,693-square-foot model. The top-line model is 2,186-square-feet and is priced at $199,900. At the right price, Krotik said a new house makes a lot of sense for a homebuyer. He said the less desirable alternatives include: short sale, which can take up to a year to negotiate and close; and a bank-owned sale, which can place you in a bidding war. In addition, the $8,000 tax credit for first-time homebuyers should help to spur additional sales. To qualify, the home purchase must be made before April 30, 2010 and must close by June 30, 2010. Talk to Robert Martelli, vice president of JKB Homes Corp. in Turlock, and he is less than optimistic about a quick recovery. He believes jobs are the key to a new housing rebound. 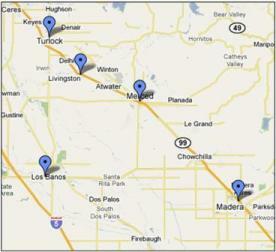 In the Turlock-Modesto area, unemployment is approximately 17 percent. “If you don’t have a job, what does it matter,” said Martelli, who estimates a true recovery could be a couple years away. Talk about Madera County and jobs, the lack of, again is the key to the housing recovery. Esther Riffel, a Century 21 M&M and Associates and a director of the Madera Board of Realtors, said unemployment is up to 40 percent in some of the county’s cities. With the jobless rate sky high, significant new housing construction could be up to six years away, she said. The Center for Strategic Economic Research reports new home construction and related activities will add $20.38 billion to the California economy this year, up from $14.34 billion record last year. D.R. Horton, the nation’s second-largest homebuilder, said new housing orders surged 45 percent and completed sales jumped 36 percent in its latest fiscal quarter, compared to the same period last year. The National Association of Home Builders recently reported its housing market index rose two points in February, a sign that low-interest rates and federal tax credits are boosting demand for new homes. Thanks for the article series on new home constructions. It’s nice to know that new homes are being built. Hope this trend keeps up.